From Willowtreecreek I got this lovely card. 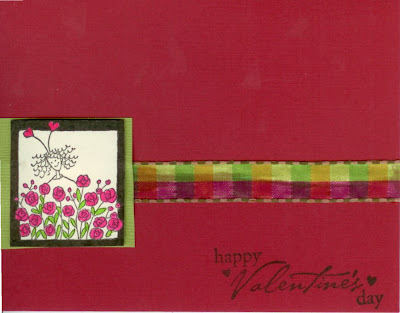 She punched with a needle the word LOVE in the top flap of the card. I love the ribbon embellishment that she machine sewed in place. A cute idea. 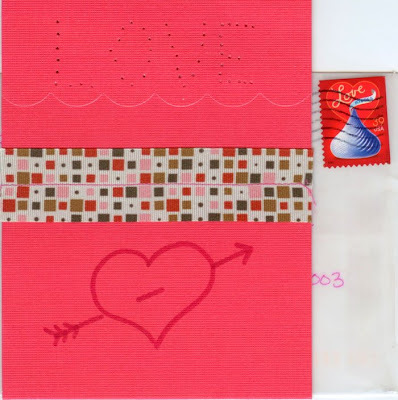 Her card came in a glassine envelope, too, with a valentine-themed stamp. This is the lovely card I was sent from summerbreeze. 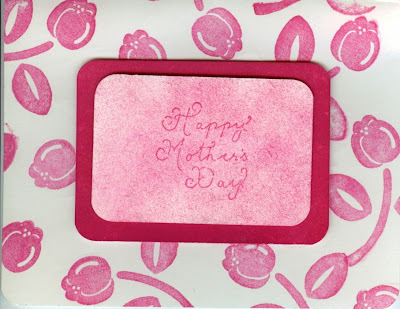 She took a lot of time coloring in the rubber stamp. There is a rubber stamp image inside that reads "Sending you a great big hug." It is hard to tell in the scan, but the little rubber stamp image on the left of the screen is actually raised up off the face of the card. I love the deep dark red of this Valentine. 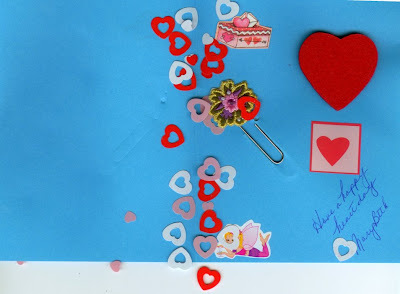 She also embellished with ribbon; we have a theme other than hearts. 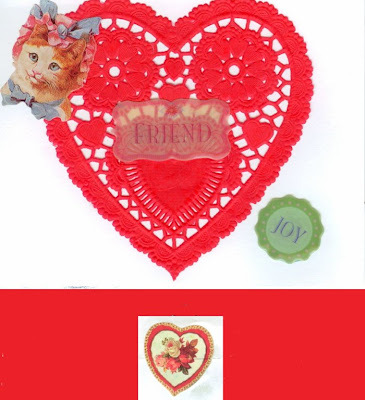 Here is the card made by sewgirlie. 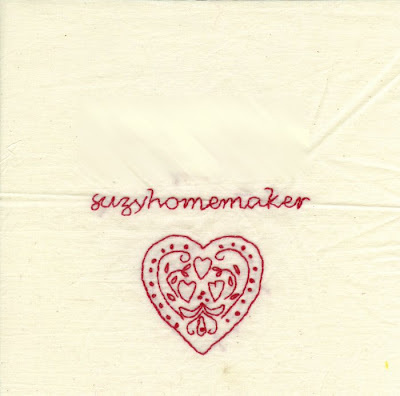 She used a red paper doily and stickers. Very cute! The red divider part of this picture was put in by me so I could show the sticker that was on the back of the envelope too. 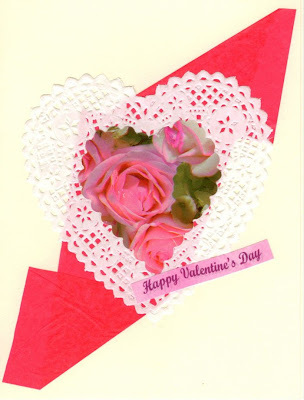 This is the card from Mary Beth. It had confetti in it, and it had a cute little paper clip that she embellished to make into a book marker. Once again my husband's office had confetti all over it. I need to be more careful when I open these things; some of them just attack. I took two scans of it because the inside was as cute as the outside. 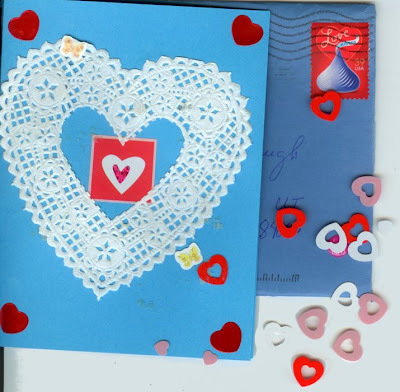 The stamp was even in the Valentine theme, just like Willowtreecreek's. Ahhh another theme. Paper doily again; we just have themes everywhere. My baby bug felt left out of the Valentine fun. So she went digging around in the cards she got from the barter party we went to during the summer. She found one that was the right colors and decided that was a good card to give me. She drew inside of it first, then gave it to me. She is only five so she can't read very well yet. As you can tell, it reads "Happy Mother's Day". It was a happy mother's day too. I am her mother and I was grinning from ear to ear when she gave it to me. Ever have one of those block swaps that once you get the blocks home you haven't a clue what to do with them? This is one of those. This top is about nine years old. 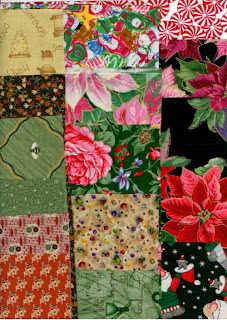 I never even finished sewing on the top middle leaf, one of the blocks I made (each of us made two). I made the other leaf as well. I never got into it, even when I was making it. I even hated my own blocks in this. I finished all the ones I had to swap but not the ones I was to keep; just wasn't in it. The colors where just too boring for me. I still don't like it, and I still haven't a clue what to do with it. Found it today when I was working on straightening up some drawers in my front room. At first I was like, "Oh yeah, I need to finish that before I unfolded it." Then it was, "Oh yeah, that one." Any suggestions on what to do with this? I am sure it is lovely to some; it is just too pale for me. I like bright colors and this has almost none of those. It is one of those quilts that haunts you for years. You have nice memories of the ladies who made the blocks, so you don't want to give it away or donate it to charity, so it just sits gathering dust. When my siblings and I were little, my Vavo used to celebrate, and still does, tons of different cultures' ways of celebrating Christmas. One Sinter Claus morning, my older sister received a quilt as a gift. I remember this quilt very well; it went to whatever house we moved to. She has kept it all these years. She did a beautiful thing at Christmas. While coming home from California we stopped at her house to rest. She gave this item to my littlest daughter, my "Baby Bug." Baby Bug is very excited to own this item. She has been told by me to be careful with it because it isn't a new item. She is happy just to have something from her Tia. This is about 30 years old. 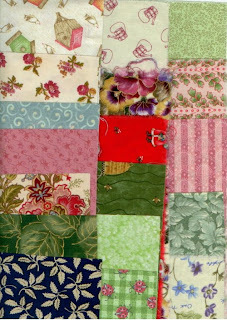 This is a picture of the first quilt I ever made over twenty years ago as a teenager. I was taking a one on one class from my cousin who at the time owned a fabric quilting store. This is twin size. I was making a Trip Around the World quilt but I didn't like the pattern very much at the time. It was enough that a punker girl was in a traditional sewing class with my grandmother picking traditional fabrics, dusty and pale blues. So I decided that I had to re-work the pattern somehow without being too obnoxious to my cousin and Va-vo, because they are very nice. So, I decided it would be called "X Marks the Spot" instead of Trip Around the World. Just so the world knows, I wanted to make a black, white, and red quilt. One of these days I still will make that quilt, because I still want to. What I did was I left the middle strip the same and I switched the left and right sides of the quilt to make a big X instead of the traditional square on point look. I was impatient at the time and didn't want to learn to quilt. So I tied it with pink yarn. If you know me, I hate pink (especially as a teenager; I am starting to like it now, along with Valentine's Day). I didn't pick the yarn; my Vavo did. I used this quilt so much as a teenager that it got pretty worn out. So now, as an adult, my WIP is to repair and replace parts of this quilt. I have made the patches for all the torn blocks. I am also replacing the pink yarn with white buttons. I really don't want the quilt to be used any more, so I figure buttons will curb that. The other special part about these buttons is they have been collected over 4 generations and two sides of the family. My Vavo, Tia Deannie (great-aunt), aunt, cousins, me and my kids and my mother-in-law and Grandmother-in-law Ernst donated some of these buttons, plus a few friends, too. Just an FYI, the buttons are plastic, not mother of pearl, and all are white. I am still collecting them to finish this project. So, this is my FIRST quilt that I hope will LAST, thus the title of this post. If you notice in the pictures, the center blocks are different colors that is where the holes were. The holes were created from where I use to sit on my bed, right in the middle of it, doing my homework as a teenager in high school and as a young adult in collage. Funny to say homework wore out my quilt, but it did. Because this is just a family quilt, and not something historical, I just replaced the fabric with ones that I purchased as a teenager; they are period to when the quilt was made, but they are not matched, as you can tell. 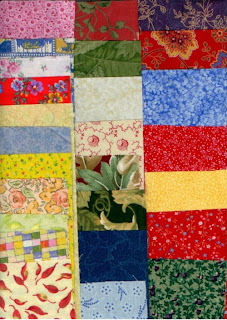 I don't mind that for personal use; it shows the quilt had a life, yet it stays period. Anything historical I would take to a person who has historical fabrics and try to match exactly. 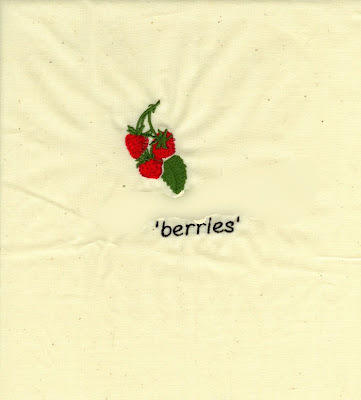 The other option is to stop use and cover damaged areas with organdy (basted) to hold damaged fabric in place, but not add anything new to the quilt because that changes the age of the quilt. 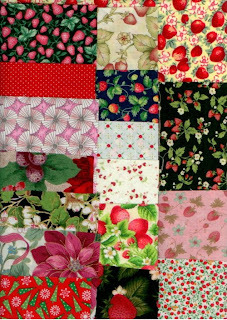 Organdy basted is reversible and does not change the age of the quilt. Top and bottom photo are true to life; the middle two had bad lighting. 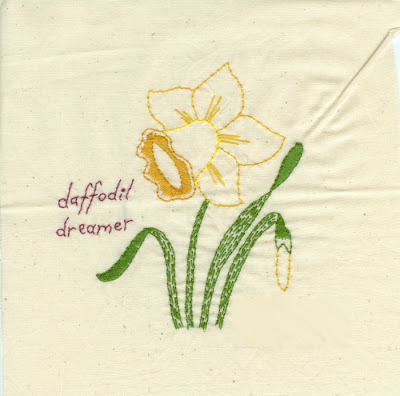 I am in charge of a signature quilt block swap at MJF, where each person embroiders blocks with a picture screen name and real name. They send to a central spot to exchange out. Once that is done, they are sent back through the mail and they get them back. I am waiting on two of the six (bummer one set got lost in the mail). These pictures have been edited on my computer; I didn't want to show the people's real names without their permission. So all you will see is what they embroidered and their screen names. So if they look one sided to you, it is because you aren't seeing the other part of the embroidery. This should only be a few more days till I have all of them and can send them back. Today in the post the mailman brought me such a nice box from Bemoosie. It was full of books on cross stitch. I don't do much cross stitch anymore, but every now and again I like to. 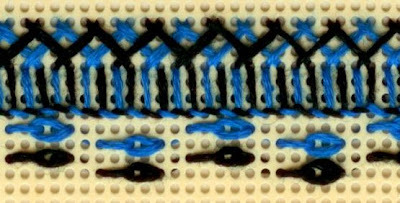 Plus, you can use them as duplicate stitch pattens and latch hook patterns if there is no outlining in the pattern. They also work great for bead work patterns and knitting pattens for color change and single crochet color change, too. Also, it's simple for my children to start in the needle arts with cross stitch. There was also a stained glass book. I made lots of stained glass in collage, lots being three (not really a lot). I want to get into that more, so that is a real neat book to me. I knew all those items were coming in the mail before they arrived, but she surprised me and tossed in a half apron. It was from California, to boot. 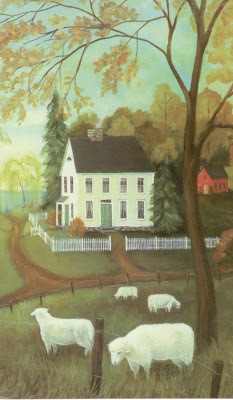 If you have read my blog, you know that is where I grew up. So that was just extra special; I love that it is so bright, too. This is the card that came with the package. Even though it is not Tuesday here in Utah, it is on the other side of the Earth. I believe the blog that hosts TAST is in Australia, so it is always a day ahead. She has posted TAST already for the day. I got my perforated paper sample done today. I will work on the fabric one through out the week. It was a little cold this weekend so I decided I would make a shawl. Mind you not a very warm thing. Also not easy to knit when your five year old loves the texture and keeps pulling at it, while you are knitting. Funny, I made it in a pastel. I don't normally wear pastels so I don't really know what I was thinking, but it will be nice at Easter time if there is a chill. If not, my kids will probably just have fun wearing it around the house. I can already tell that will happen. I made it up; not very hard, mind you. Cast on one, knit entire shawl. Increase 1 stitch at the end of every row till you have 50 stitches on needles. Knit to desired length, then knit 2 together at the end of every row till last stitch. Finish thread. Done. The triangle points I am going to use as ties, I might at times put a mother of pearl buckle there to hold them together too for a little more formal look. Over on Bella Dia's blog she has been talking about striped blankets and the like; she also has a flickr group. So here are the three in my house. Two are from my husband's grandmothers. They where both wedding gifts. The top multi-colored wool one actually won 1st price at his grandmother's county fair in Lincoln County, Nevada; pretty cool. update free pattern for this . I have the ribbon on the wall in my bedroom, his grandfather gave it to us two years ago so it could stay with the afghan. That one was from his maternal grandmother, very prized possession as she is in heaven and was a lovely lady. From his fraternal grandmother we received the blue on blue one; it is acrylic. She loved crocheting and belonged to a needle arts group. Also a very nice lady, now in her mid 90's. The last one I started about three years ago as a gift for my husband, multi-color on bottom acrylic. At the moment it works great as a sofa blanket; it's long enough not to have a war. In time I want it to fit our king size bed; it has a ways to go on that. 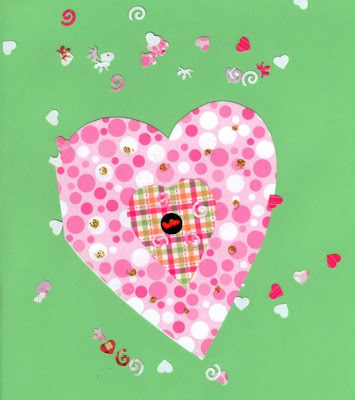 If you are into making valentines and making yo-yos, I have a group on flicker about yo-yos. 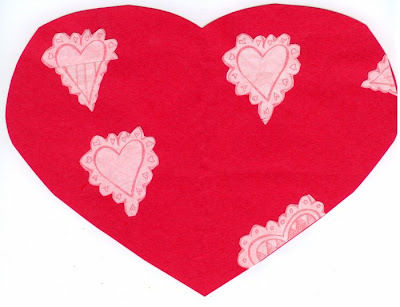 Within that group there is a challenge going on; it is to make Valentines using Yo-yos (not the toy, but the fabric). I would be ever so happy to see what every one can do with this. You can add as many embellishments as you want as long as one yo-yo is in the mix. There is a great tutorial at Heather's site if you don't know how to make one (a yo-yo, that is). Here is a sample I made; this has three yo-yos in it, plus other stuff. We will have a vote here on the week of Valentines. 1st - 3rd will get prizes. Your items must be posted on flickr in this group to be judged. See rules here and on flicker (same rules just posted in two spots). 2. Post finished photos here in this group. 3. Item must have at least one yo-yo in it to compete. 6. If you have questions let me know here or on flickr. 7. Enter as many different valentines as as you want. 8. After contest I will contact you through flickr mail to get your address to mail your prize if you are one of the three winners. 1. Due by February 11 the Sunday before Valentines Day ( in the United states) This gives the people on the other side of the world 1 more day. I don't want to figure out time zones. 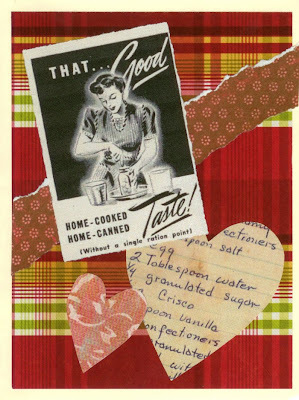 Yep they are stuff I have been using to make Valentines. I would show you one of the finished ones, but the people getting these look at this blog. So, you will just have to guess from what is in this photo of the remnants of the supplies . In the post (mail) a few days ago I received a gift from Miss Bee Haven at MJF. 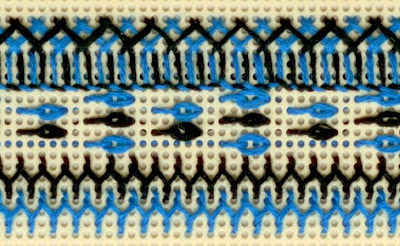 She had noticed that on my blog post of Jan 10 that I liked to use beads in some of my work. The item was a gift for my husband. So she sent me an email asking if I could use any more beads and said she had some old ones. Sure, beads are always good, especially old ones. When they arrived they where defiantly vintage ones; they look to be from the 1920's or before. Very lovely! Thank you, very much. I will have to find a special project for these because they are very nice; it might be hard to tell that in the photos, but they are lovely. This is the card that came with the beads. Even though I haven't been showing Valentines for the last few days, I have been working on them. This is a picture of the different colored envelopes I made. I actually made about forty-five of these; this is just a sample of color. I got my list of who is in the swap today -- thirty-four people -- so I had made a few extra. Oh well, envelopes are always useful. I will get to work on the rest of this now. 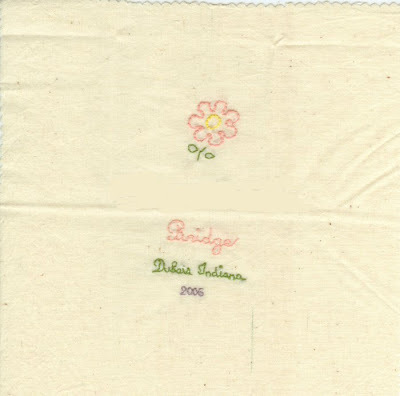 Here is my sample on my little 4 inch wool square. I played with satin ribbon, wool, cotton, rayon, beads, buttons, sequins. I think I went a little overboard, too. I should have had more cool colors and not so many warm; oh well ,it is a sample. I may add a few more flowers, now that I have seen it in a picture. It looks like it has a few holes I don't like. Week 3 Then I decided to add a few beads to week 2 since I had the beads out. Here is the perforated paper one. Over Christmas and New Years I finished up the two charm swaps I was in charge of. There were twelve people in one, and six in the other, each sending at least four different fabrics to swap. Some sent more than four fabrics, so not everyone got exactly the same. I don't think I got all of the fabrics scanned before I sent them back, but here is a good variety of them any way. Each one of the little swatches you see is just a section of the real piece that is 12 inches square. So, if you where in both swaps, you received 18 x 4 = 72 different squares back, each being one foot square; that is a lot of variety to add to ones stash. When all laid out, they cover an eight foot by nine foot area. If you wanted to, there would be enough to make a quilt top. If you click on the photos you will see the fabrics better. Seventy-seven (77) different fabrics are pictured here. While in California we took a few pictures of about 1/3 of my grandmothers decorations. I memory card got full. Oh well I will show you what I got any way. Just need to realize there is about three times what you are seeing. The Santas to the left here are on the inside stair case going up stairs. My Vavo painted about twelve of these one year. None of us have them. It is one of the few things she actually made for herself and didn't give away. At the Santas feet are some of my Va-vo's blocks they are scattered about the house and will probably be some where in most photos taken during this holiday. The next photo you see the beam of kissing balls. These are the real old ones my grandmother made in the 50's till about the 80's. The new ones are hanging from chandeliers and a Christmas tree in another room. They are also decorating one of the wood gifts for the year. In this picture it is still the beam of balls but you can see other decorations too. On the right side you see my Vavo's little kids tree. Meaning it is made out of wood children. She had my No No cut all those and about 500 more one year and made wreaths and trees and other things out of them and gave them away. I was a kid then so I never got one. Next to that you can see some little wood houses she had cut by No-No and she painted them. Once again about 500 more than what you see where made. I do own some of those. If you click on the picture to see it bigger you will see a tower of tables that is what she made this year. Store bought and No-No is in heaven. But she painted them all. Also in the blow up you can just see some wood angels in the back of the room at the top of the wall that she made a long time ago. Those where carved and painted. No-No cut them too. This next item is know as a Swedish tree. When I was a kid it had a lot more hand made ornaments on it. But as you can tell it leans a lot. Over the years growing up it was knocked down a lot and we broke the limbs and knocked it off kilter. Plus we broke a lot of the ornaments too. If you notice the lower branches are metal where as the top ones are painted red wood. My Vavo keeps fixing it. We actually have two of these in the house the other is smaller I just never took a picture of the other. On top of this tree is an angel bu this one is a Swedish angel made out of straw. There are bread dough ornaments cloth ones pewter, Swedish, store bought, handmade. You name it this tree has it on it. Below the tree are more blocks waiting to be branded. If you look closely at the picture on the top is what use to be our family sheep brand about 100 years ago by my great grandfather. It has since gone to someone else. We don't use it as a brand any more just decoration to remember the past. The next two photos are of this years wood gift. She painted little tables for all of use that are married and have households. Mine is Green with a Christmas wreath painted on it It is one of the round ones as there are two styles. AS there is usually an argument as to who get s which item my Vavo had us draw numbers this year and we picked in that order. With over 64 people coming to Christmas. It is real fun on the day of Christmas eve, presents just kept coming. At first they where all just stacked in one pile. But if we leave them that way a great big mess ensues trying to find every ones presents and get it to them. So during that day it was my project ( job) to sort out the presents and make stacks of families, so it would be easier. We choose my generation and the ones above to make stacks out of. If you are younger than that, you have to find who your pro generators is in the previous one or two generations and find that stack. With five generations all together there are lots of us, too many small stacks if we go down to many more generations so we stop at he first three then it is your parents or grand parent you have to find. I hope that made since. We open presents Christmas eve so this is only like this for about five hours. As people approach the house Christmas eve they are greeted by about six outside Christmas trees only two of my photos came out half way decent so you will only see a tiny bit of it. Click on the photos to see the trees .